The capital of Vietnam, Hanoi has bounded back from the effects of war, and today serves as a bustling commercial and cultural hub bursting at the seams. 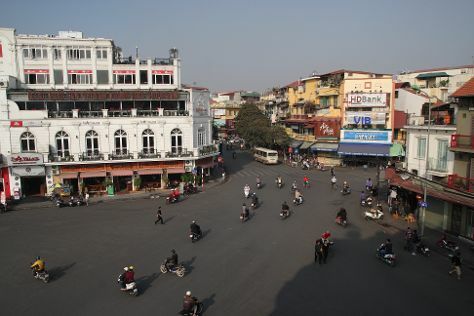 Hanoi is known for historic sites, museums, nightlife, nature, and spas. Your plan includes some of its best attractions: appreciate the extensive heritage of Old Quarter, contemplate the long history of Hoa Lo Prison, take in the spiritual surroundings of Temple of Literature & National University, and don't miss a visit to Ba Dinh Square. For more things to do, reviews, ratings, and more tourist information, read Hanoi online vacation planner . Paris, France to Hanoi is an approximately 15-hour flight. You'll lose 6 hours traveling from Paris to Hanoi due to the time zone difference. Wrap up your sightseeing on the 30th (Mon) to allow time to travel to Ho Chi Minh City. Start off your visit on the 31st (Tue): take in the spiritual surroundings of Chùa Giác Lâm (Giac Lam Pagoda), look for gifts at Thuy Design House, and then don't miss a visit to Cu Chi Tunnels. Here are some ideas for day two: get engrossed in the history at War Remnants Museum, take in the architecture and atmosphere at Saigon Notre Dame Cathedral, then ponder the world of politics at The Independence Palace, then ponder the world of politics at Central Post Office, and finally explore the activities along Bach Dang. To find where to stay, more things to do, other places to visit, and tourist information, go to the Ho Chi Minh City trip builder . You can do a combination of bus and flight from Hanoi to Ho Chi Minh City in 1.5 hours. Other options are to drive; or take a bus. July in Ho Chi Minh City sees daily highs of 38°C and lows of 28°C at night. Wrap up your sightseeing on the 2nd (Thu) to allow time to travel to Phnom Penh. 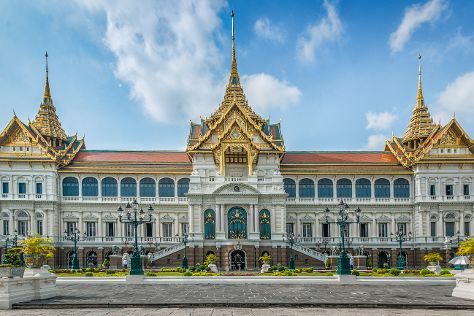 Start off your visit on the 2nd (Thu): look for gifts at Friends 'n' Stuff, step into the grandiose world of Royal Palace, and then contemplate the long history of Choeung Ek Genocidal Center. Get ready for a full day of sightseeing on the next day: browse the eclectic array of goods at Central Market, then take in the spiritual surroundings of Wat Phnom, then see the interesting displays at National Museum, and finally get engrossed in the history at Tuol Sleng Genocide Museum. 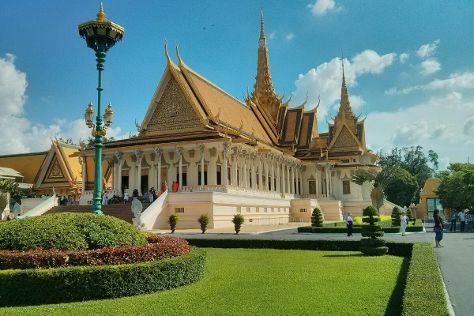 For ratings, other places to visit, more things to do, and tourist information, read our Phnom Penh trip itinerary builder site . You can fly from Ho Chi Minh City to Phnom Penh in 2.5 hours. Alternatively, you can drive; or take a bus. In August, daytime highs in Phnom Penh are 39°C, while nighttime lows are 30°C. Finish your sightseeing early on the 4th (Sat) to allow enough time to travel to Siem Reap. Spend the 6th (Mon) behind the viewfinder with an inspiring photography tour. There's still lots to do: delve into the distant past at Angkor Wat, take in the spiritual surroundings of Ta Prohm, steep yourself in history at Angkor Thom, and relax and rejuvenate at some of the top local wellness centers. To see more things to do, where to stay, photos, and tourist information, refer to the Siem Reap itinerary website . Traveling by flight from Phnom Penh to Siem Reap takes 2 hours. Alternatively, you can drive; or ride a ferry. Expect a daytime high around 38°C in August, and nighttime lows around 30°C. Wrap up your sightseeing on the 6th (Mon) to allow time to travel to Bangkok. Bangkok is known for historic sites, shopping, nightlife, spas, and nature. Your plan includes some of its best attractions: step into the grandiose world of The Grand Palace, take in the spiritual surroundings of Wat Pho, admire the landmark architecture of Jim Thompson House, and identify plant and animal life at SEA LIFE Bangkok Ocean World. To find where to stay, ratings, other places to visit, and other tourist information, you can read our Bangkok trip itinerary planner . Do a combination of flight and train from Siem Reap to Bangkok in 2 hours. Alternatively, you can fly; or drive. In August, daytime highs in Bangkok are 39°C, while nighttime lows are 30°C. Wrap up your sightseeing by early afternoon on the 10th (Fri) to allow enough time to travel back home.